A wonderfully dramatic Cluster Diamond Ring made in 18ct white gold and set with Round brilliant cut Diamonds and Marquise cut Diamonds. This ring is an impressive Diamond Ring. 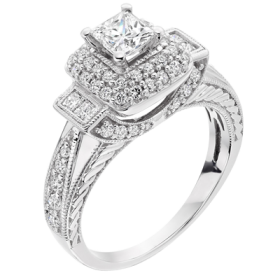 Visit our store to see our selection of Diamond Rings. Quite often a lady would like a nice Diamond D Ring for her right hand; something a little more daring and different. Diamonds are a girls best friend and a right hand definitely suits a diamond every bit as much as the wedding finger. The problem lady’s often encounter is finding something which doesn’t resemble and engagement ring. 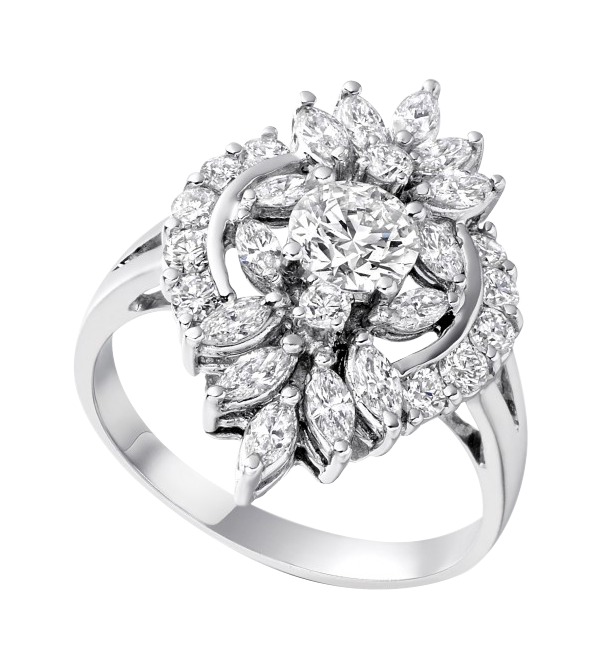 This brilliant diamond dress ring is a great choice for the more flamboyant lady. Not only is it substantial in size and therefore fills the finger but the cluster of diamonds makes it all the more decorative in style. The ring is made from 18ct white gold and 2 different cuts of diamonds are used to create the cluster. A round brilliant cut diamond centre has been surrounded by both round brilliant cut diamonds and marquise cut diamonds. 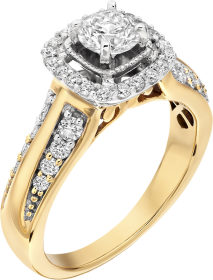 This combination creates a dazzling scintillation on the finger. The sparkles is magnificent as the wearer moves and the detail of the ring can be appreciated on closer inspection. If you want to design your own diamond dress ring then D & K’s bespoke custom made ring service is a great choice. 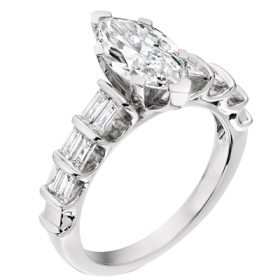 We can create a diamond ring to suit your finger, sense of style and budget.